Heading out for a day sail or even an offshore passage? It’s important to be prepared for all conditions. Reefing your sails is an excellent way to enjoy big breeze, while still being safe and comfortable. When heading out for the day, be sure to check conditions ahead of time and don’t wait for things to get too rough. It’s easier to shake out an unnecessary reef, opposed to putting it in while underway in breezy conditions. Reefing can protect your boat from damage and make the sail more comfortable, but if not done properly can also add extra wear and tear to your sails. Make sure to protect the luff of your sail by putting the luff tension on first, whether you have a boltrope main or a slide main. Release the outhaul and vang before dropping the mainsail down to the desired reef position. Secure the tack of the reefed main and take up on the halyard ensuring there is good tension on the luff – keeping the sail pulled forward. After the luff is tight and secured, take up the slack on the reef line on the clew and ensure that there is good tension on the foot of the sail. The number and location of reefs in the mainsail deserves thought. 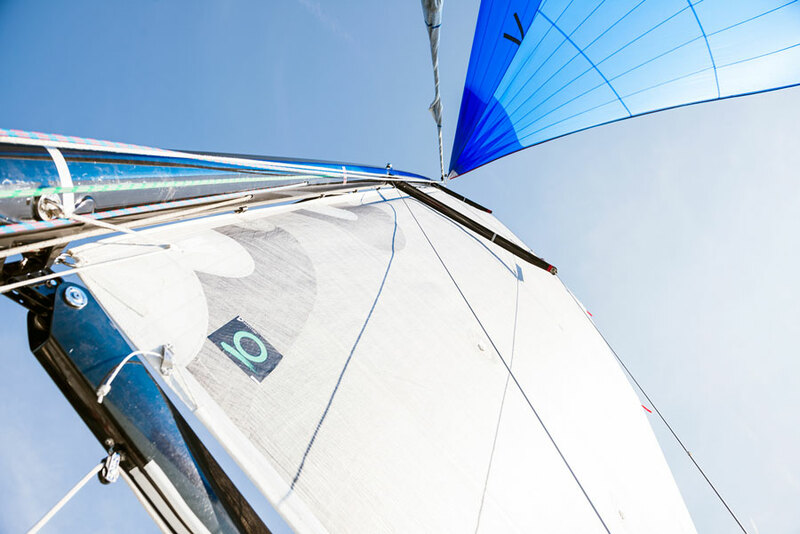 The typical cruising mainsail configuration uses two reefs that are normally placed at intervals of approximately 12% of the luff length. They do not reduce area as a standard percentage. In fact, a first reef will reduce more area because the sail is wider at the bottom. A third reef is sometimes added for offshore work, again at another 12% of luff length (36%). Few boats, however, are set up with reef hardware for three reefs. The third reef will slightly decrease the overall durability of the sail (by adding weight to the leech), and necessitate hardware changes to the boom to allow for a third reef line. If there are no plans to sail offshore, two reefs will be plenty. In fact, most sailors who limit their sailing to local trips don’t sail for extended periods in high winds. The only high wind they will see will be in localized squalls, when they will probably take the mainsail down completely. Another approach to the problem is to space two reefs at slightly deeper locations than normal, approximately 15% and 32% of the luff length. With offshore sailing in mind deeper reefs make sense. Some of this decision is boat specific. Certain boats may need more mainsail, or balance particularly well with a 12% reef. The struggle involved with moving from a second to a third reef is an indication that being more conservative, and taking away more area with each reef, is simpler and generally makes the most sense. Serious offshore sailors often opt for a storm trysail, and eliminate the third reef. Using a single line to control both the reef tack and clew has become popular. One should recognize that single line systems introduce a great deal of friction (particularly when they are led back to the cockpit), which can make it hard to reef. Single line systems work better with blocks in the reef tack and reef clew instead of standard grommets. Care must also be taken to address the angle of the tack reef line, position of the tack grommet, and hardware spacing relative to the reefed tack. Be sure to discuss this issue with your sail consultant prior to design. It’s important to know the limits of your boat and your crew and to be prepared for breezy conditions. By using a reef you can increase the number of enjoyable days spent on the water.